In an overgrown, empty lot at 37th and Woodlawn in one of Kansas City’s long-identified “food deserts,” the Ivanhoe Community Garden took root in the spring of 2011 ─ a collaboration of University of Missouri Master Gardeners of Greater Kansas City, the Ivanhoe Neighborhood Council and Kansas City Community Gardens. The garden and the Ivanhoe Farmers Market at Lynwood and Woodlawn – another Ivanhoe Neighborhood Council initiative – were welcome developments with a full-service grocery store missing from the community and nearly half the people in the neighborhood without private transportation. The Ivanhoe Community Garden is now about 90 percent individually maintained raised beds acquired from the Ivanhoe Neighborhood Council. Some 22 gardening plots in the original garden produce an estimated 2,000 pounds of vegetables. The community garden production outside the individual plots is sold at the Ivanhoe Farmers Market along with extra produce from the individual gardeners, benefitting both the gardeners and the Ivanhoe community residents. 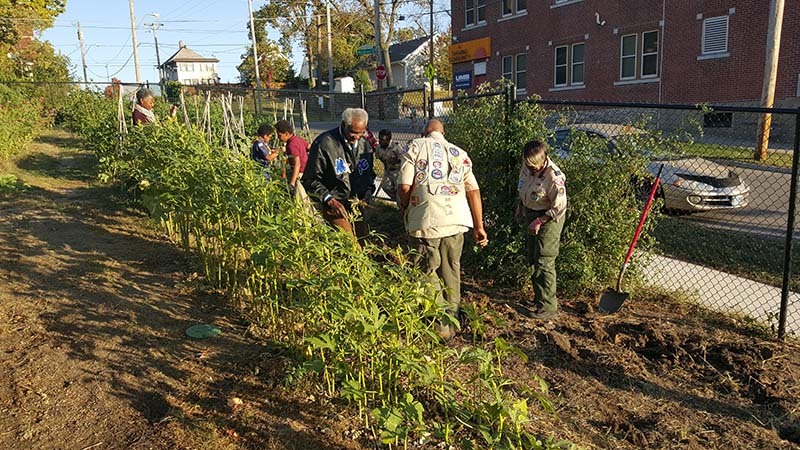 “When the garden began, most of the work was done by the Master Gardeners, especially teaching interested neighborhood people how to garden successfully at the lots where decrepit housing had been razed,” explained Davis. “The original garden was an inspiration as more neighborhood people took ownership to produce fresh vegetables for their families and the market for the neighborhood. Gardening was contagious. 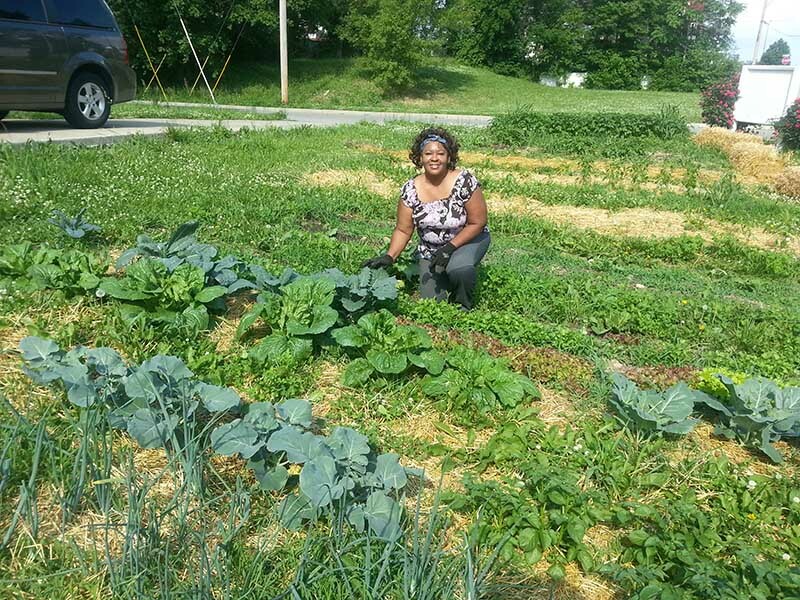 The community garden was a catalyst inspiring more programs to involve the community. Davis said with the success of the original garden, the Ivanhoe Neighborhood Council wants to see more gardens developed. There are still some large portions of the neighborhood with no garden, but there are plans to develop them. The Ivanhoe garden has been able to buy a big tiller and a small one to support the gardeners. When the garden first started it wasn’t fenced and water for the garden was a challenge. “We tried to drag hoses across streets if the garden needed water,” Davis said. “Now it is fenced, and the Ivanhoe Neighborhood Council has been able to install three water taps for the gardens. The INC has also installed a wash station for the fruits and vegetables and partnered with KCPL to develop a refrigerated building to preserve produce. Davis said neighborhood kids have gotten involved in the garden too. “A large majority of the grandparents in the neighborhood grew up on small farms or had some farm background growing things,” Davis said. “They got more and more interested in the garden and helped younger people get interested. The young people knew nothing about gardening. They had never even seen a potato dug up. Most popular in the garden and most quickly snapped up at the Saturday market are garlic, sweet potatoes, okra, collard greens, tomatoes, cucumbers and cabbage. The Ivanhoe Farmers’ Market opened in 2012 as an extension of the gardening developments and the award-winning “Grown in Ivanhoe Project.” Since then, the market has made hundreds of pounds of fresh, local, affordable, neighborhood-grown produce available to the Kansas City community. The garden, originally a teaching tool for best practices in low-cost food production, and the market underpinned major strides in the Ivanhoe community for neighbors to access seasonal fresh fruit and vegetables as they took ownership in reclaiming and rebuilding their community. Next StoryIt’s Time to Harvest Your Peanuts!